5793 labyrinths found. Showing 3881-3900. Sorted by country, state, city, then zip/postal code. The labyrinth is located on the church patio with excellent lighting 24 hours a day. Ample parking is available. Our lawn labyrinth is located on the west side of the south lawn under beautiful shade trees. Labyrinth is painted on the parking lot south of the church building (across the street from the south-west corner of the church). Labyrinth is free and open to the public, but may be unavailable during church services and other times when the parking lot is in use. Quiet residential area. The labyrinth is located inside of the old bank vault inside of Red Path Gallery & Tasting Room on the North side of Historic Downtown square in Seward. 41-12'52"N° Lat. ; 098-27'35" W° Long. This is our outdoor labyrinth. Remember, we also have a canvas one too. 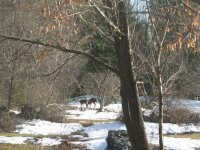 We are a retreat center located on the banks of the Platte River just west of Omaha, Nebraska. 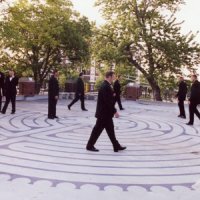 We invite people to walk our 80 foot outdoor Chartres labyrinth. 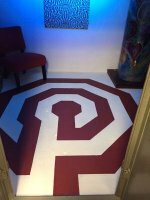 The Center also makes our portable canvas Santa Rosa Labyrinth available to groups for use at their site. Groups meeting at the Center can use the labyrinth at no additional charge. 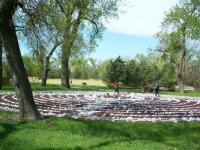 See Facilities and Fees page for portable labyrinth off-site costs. Wedding - Bride and Groom enter from North and South respectively for ceremony in the center then exit throuh the arbor in the East. This is a mobile labyrinth - depending on where I am, I can bring the labyrinth to you. A 30 foot canvas labyrinth, great for family gatherings, weddings, festivals, farmers markets or any public event . Daily, 10 am to 6 pm, July 1 through September 30. 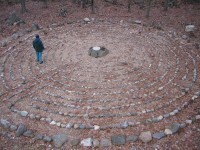 This labyrinth is at my home, but I am happy to have people walk it if I am notified first. 43 25.96° Lat. ; 71 19.58° Long.